Rediff.com » Movies » Like the Aiyyaa trailer? VOTE! Like the Aiyyaa trailer? VOTE! The trailer of the eagerly awaited Rani Mukerji film Aiyyaa was released today. Producer Anurag Kashyap also shared the poster of the film on Twitter. Aiyyaa is about a spirited Marathi girl named Meenakshi and her comical ways. Meenakshi falls in love with a South Indian guy played by Malayalam and Tamil actor Prithviraj. Directed by Sachin Kundalkar, Aiyyaa releases on October 12. Just couple of months ago, Farah Khan had publicly apologised to actor Ajay Devgn for the remark that she made on Karan Johar's chat show, Koffee With Karan six years ago. On the show, Farah called Ajay the 'most overrated actor'. Looks like the comment didn't come in the way of their equation. Farah and Ajay are bonding on the sets of Sajid Khan's next film Himmatwala as she is the choreographer for the film. 'In hyderabad..in my 20 yrs of choreographing 1st time doing a song with Ajay devgan..he's a really cool guy.good fun becoming!' she tweeted. Why is Priyanka Chopra nervous? With the release date of Barfi! and her debut single In My City inching closer, Priyanka Chopra is feeling the jitters. '7 days to go...for My single 'in my city' and my special film 'Barfi' Jeeeez! Scared...excited... nervous,' she tweeted. Meanwhile, Shilpa Shetty who recently won an award for her spa Iosis is now opening a franchise in Lucknow. 'Hey Tweetos won an award today,my partner Kiran collectd it on r behalf .Neverthes still happy as I got it fr something other than acting! Won entrepreneur of d year 2012 fr Iosis my Spa-Salon n wellness boutique.A proud moment as v open r Lucknow franchise on 14th sept.Yippee:)' she tweeted. Sonakshi Sinha is in Oman busy shooting for Once Upon A Time In Mumbaai 2, opposite Akshay Kumar. 'Sun, sand, sea and me!! Loving the beautiful Oman... Kickstarted my trip here with a photoshoot in the scorching sun.. Getting some great shots!!' she tweeted with the picture. Amitabh Bachchan who was in London on September 5 attended the book launch of renowned designer duo Abu Jani and Sandeep Khosla. 'Back from book launch of AbuSandeep at Sotheby's ... an enchanting evening .. many faces, many people, but a feel of Russian Hamlet. The glory that comes through providence can never be explained .. some call it karma, others past life deeds .. how do they know ..! Tonight's event a charity collection for 'Breakthrough', an organization that works on violence on women and women's rights.. Noble !' he tweeted. 'A picture of Amitabh and a jacket that he wore were also auctioned at the charity event. The jacket I wore was auctioned ... fetched the largest amount for the charity .. added attraction ... my perfume on it !!! Ha ha. A black and white picture framed at about 10'x5' ... from the book ! Went for a good price too ... the charity is very happy,' he added. 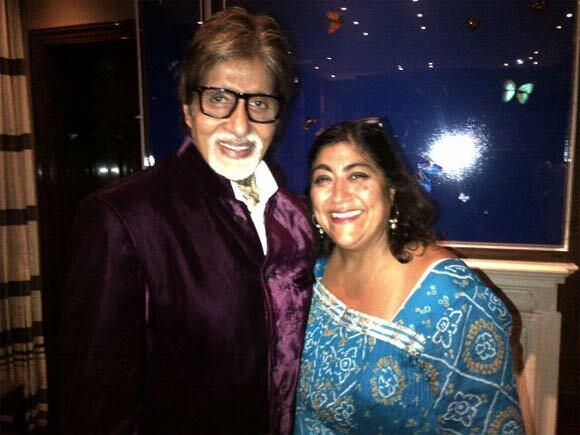 He also met up with Bend It Like Beckham director Gurinder Chadha. 'Had a nice catch up with an old friend this evening! Amitabh batchan is always so graceful and gracious. Was lovely to see him looking so well and dapper in london this evening,' Chadha tweeted with the picture (above). The legendary actor is now headed to New York for work and then Chicago where Abhishek Bachchan is shooting for Dhoom 3.